The seedling was a Pierpont, and its parent weighed-in at a whopping 1,196 pounds. And sometime within its first 24 hours in my garden, in the dark of night, a villain stole in, dug in the rich soft dirt, and killed the seedling. Pierpont is gone. 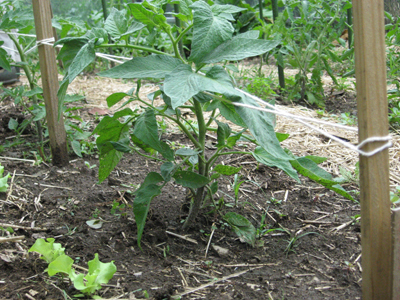 …and selected one of the few remaining seedlings left. A Powell, this time. And one whose parent weighed 1,548. A more impressive lineage and perhaps the reward for perseverance. The hole was dressed with a fertilizer called Bio-Starter, an organic multi-component mix that includes mycorhizzae, a beneficial fungi. Those little white bits? Evidence of the addition of Bio-Starter. Let there be no doubt. Next, one modest tablespoon of Superthrive, mixed with a full gallon of water. Superthrive is a hormone-type plant growth stimulator. Trust that MH the Grower is not interested in cultivating an “Oh, isn’t that a cute little pumpkin!” No, he’s going for a Powell 1548 – an Atlantic Giant. A monster. This is, after all, an entry into the Pumpkinfest Weigh-Off in October, so there’s no messing around. Superthrive it is. 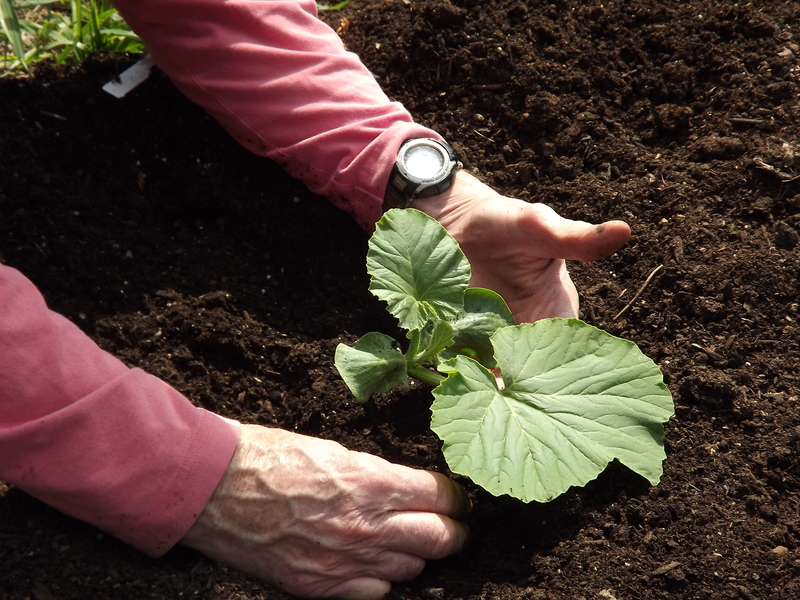 And in it goes, a robust healthy pumpkin seedling with its first set of true leaves, one of which is large and points in the direction that the main stem wants to grow. And my dog MacKenzie watched from afar, content to be near all of us, happy that she’d found some shade, and not quite certain what all the fuss was about. This photo is comforting to MH and myself, and we hope it is deeply disturbing to the assassins of the night, the ones that care not for infant pumpkins and care more for the grubs, worms, and other burrowing creatures they are certain reside deep in the compost. They will not get the chance to try again. The Powell 1548 is caged. For a day or two, at least. That baby’s gonna grow, and FAST. Stand back, and stay tuned. The former owner of our house was quite a gardener. 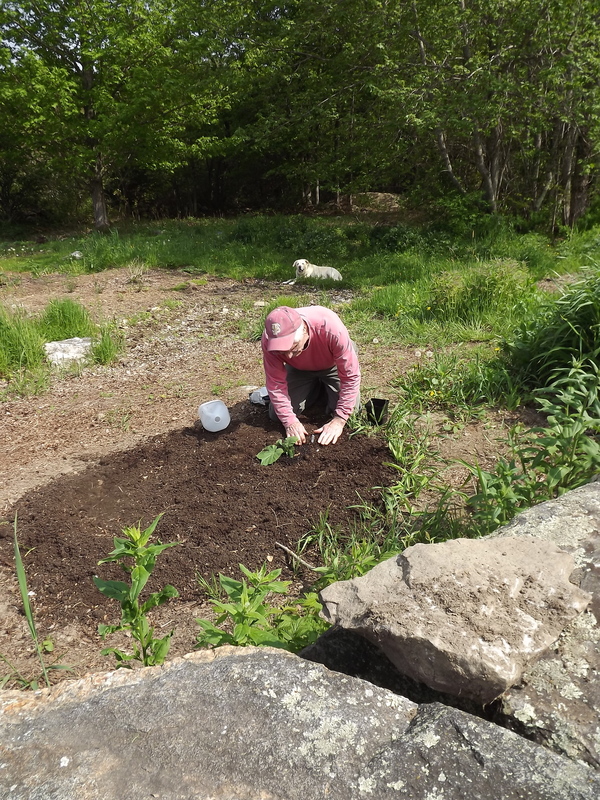 She planted lovely perennials, trees, and shrubs, and very few of them were to my liking. (But to be fair, she didn’t plant them for me.) I am living with most of her choices because I do recognize her skill, and the health and vigor of the plants. 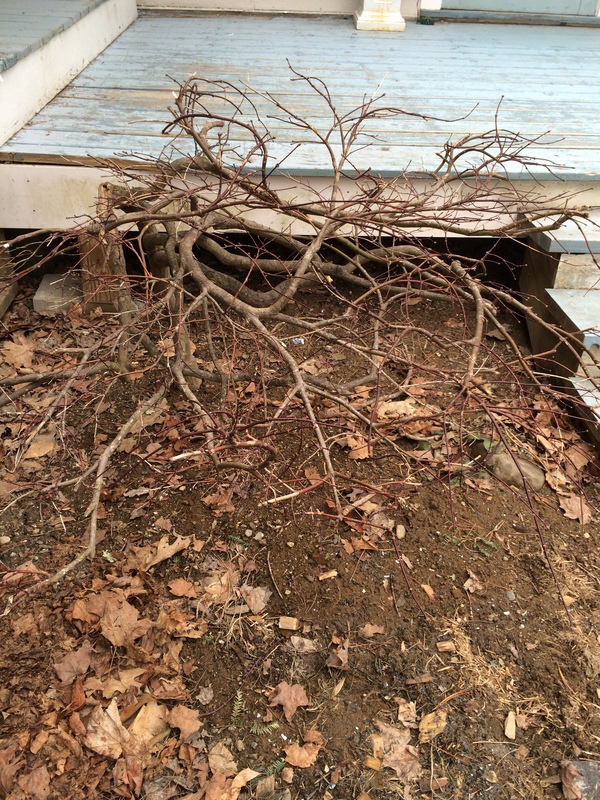 This includes two dwarf Japanese maples (acer palmatum) that flank the driveway-side of our house. These two trees met the winter in a similar way: healthy and fully clothed in bark. But sometime, during a dark winter night before the first blizzard, a porcupine (erethizon doratum) started snacking on the bark of one tree. When the snow receded, the extent of the damage became clear. And I now know why this critter’s Latin name is so apt. “Erethizon doratum”? Your translated name is “quill pig” and that’s about how I’m feeling towards you right now. Am I upset? You betcha. But perhaps not for the reason you imagine. 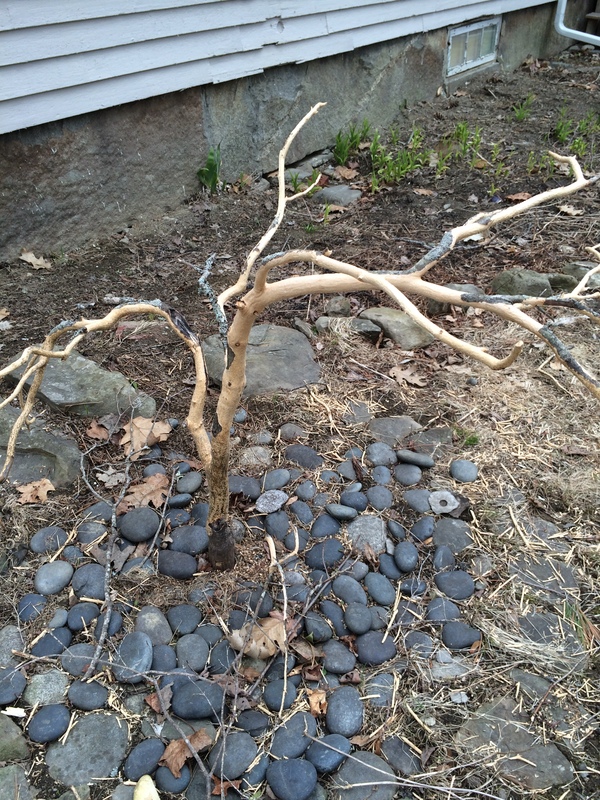 Husband is very very upset that we have lost a beautiful tree. Me? Not about that. Remember, this wasn’t my favorite inherited planting. I’m more upset that we have a porcupine close to our house and to our two dogs. Lest you think that I am a heartless, unfeeling porcupine hater, I will share two facts with you that prove that even porcupines are creatures that a mother could love (a Quill Pig mother, I mean). The snow has finally retreated, and the full extent of this winter’s damage is known. I’m hoping this is the last hurrah for our porcupine neighbor. 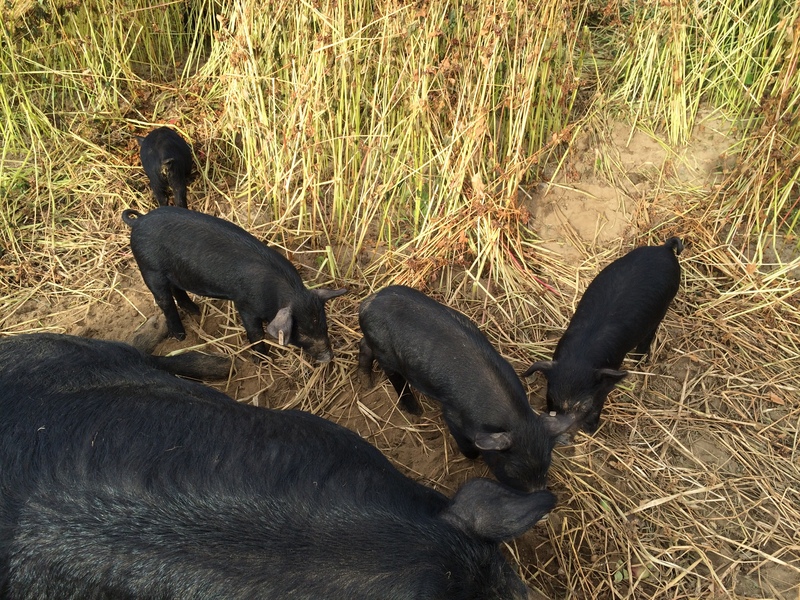 If I have to write a blog about rushing our dogs to the vet in the middle of the night for Quill Removal, you can bet I will not be including any cute facts about these little prickly pigs at the end of that post. “It’s an event like no other.” Agreed. 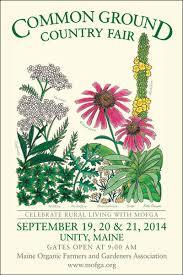 It is a place where rural life is celebrated, and where three days aren’t nearly enough to see everything. It’s a place where no one over 30 dyes their hair, and so salt & pepper are suddenly not just condiments. It is a place where people under 30 frequently do dye their hair, to colors not natural to man. Kool-Aid red, peacock blue, and eggplant purple are much more common than, say, blonde highlights. It is a place where the livestock is often enormous, the food portions are generous, and no bottled water is sold. (Yes, they’re making a point.) The event is organized seamlessly, perfectly, thoughtfully – outside of Disneyland, I’ve never seen the like. Drinking stations where you can fill your own water bottle are plentiful, as are hand-washing stations, toilets, and parking spaces. All of these things combine to create an atmosphere of peace and calm. What more could anyone possibly want? Then look over the program. There are approximately 150 presentations/demonstrations/talks given EACH DAY, over the course of three days. What are you interested in? Farming/Gardening? Livestock? Cooking/Herbs/Health? 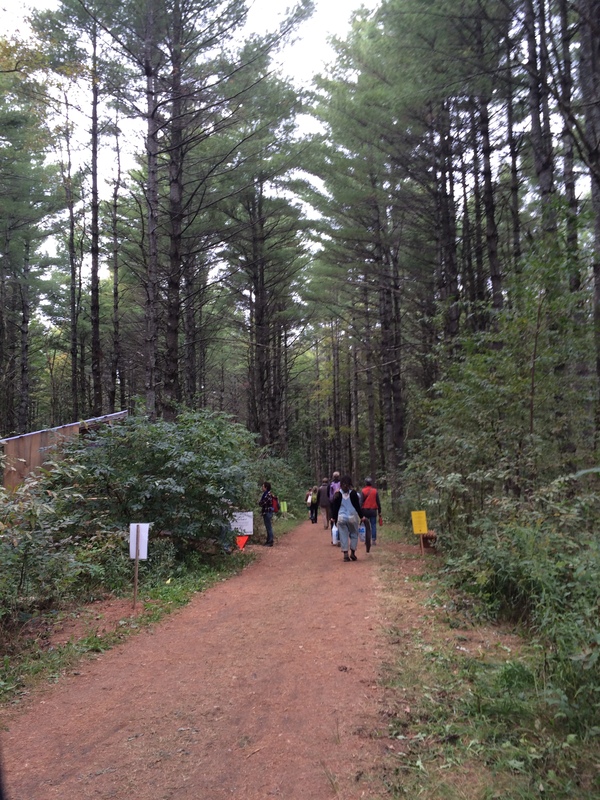 Environment/Community/Education? 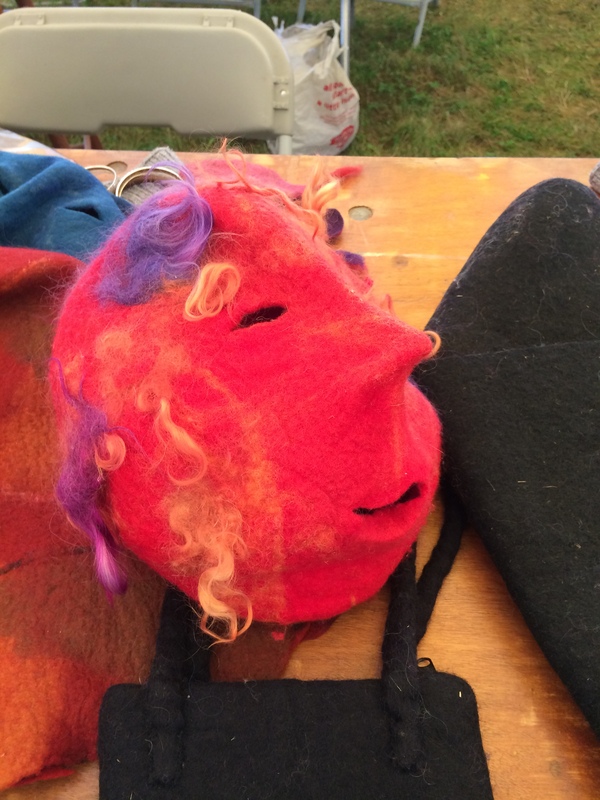 Traditional Arts/Fiber & Fleece? You get the idea. With the exception of “Basic Dowsing”, the presentations I attended were a little more mainstream. 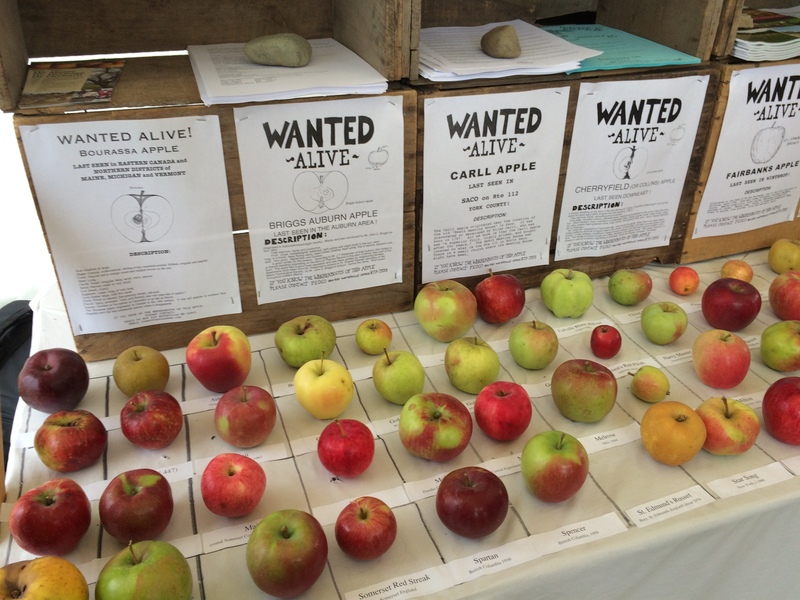 Beekeeping, heritage apples, medicinal herbs, gardening for birds and wildlife. 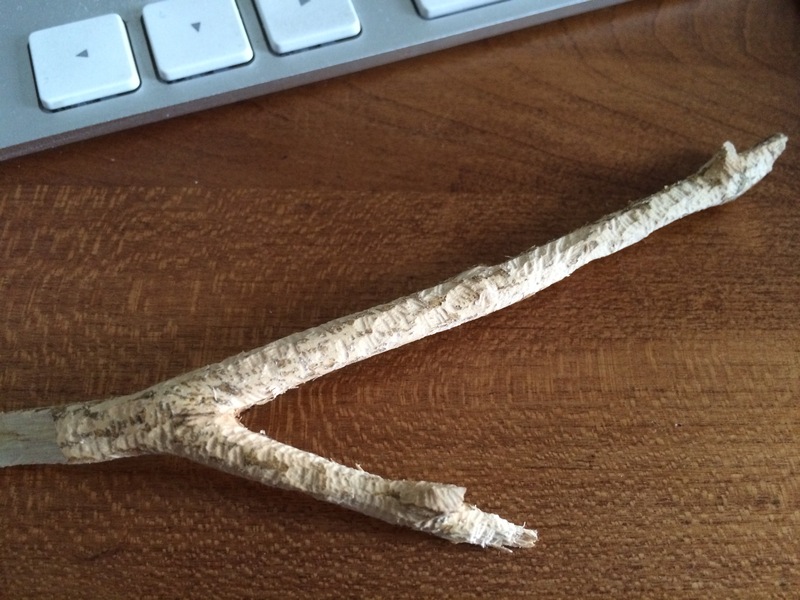 And as for the dowsing course, I may or may not write about it. I came home with two brass dowsing rods and a complete inability to explain what I experienced in that class. I am still unsettled. Let me show you some of the wonders of the fair. Of course, there was the lovely 2014 poster, which highlighted medicinal herbs, all of which I have grown except for stinging nettle. I remedied that (ha) by buying some nettle tea. 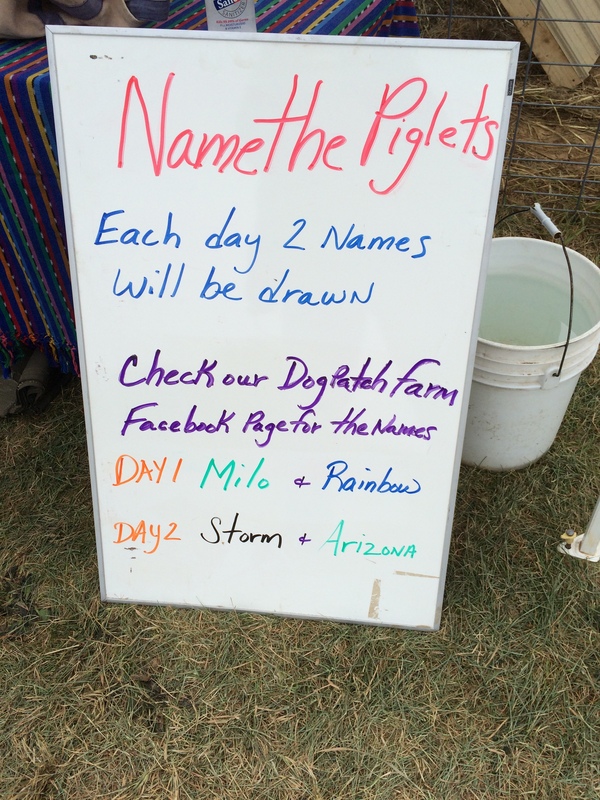 Including piglets, with a generous offer to name the 6 mulefoot hog piglets. My suggestions added to the Name Jar? Tallulah and Walter. And then, of course, there were the people. Every flavor and style imaginable. Here are a few photos. 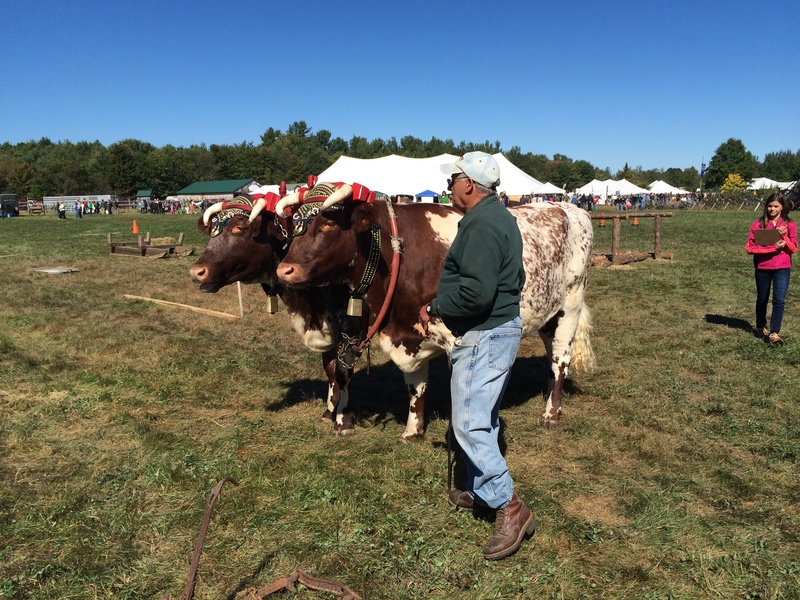 The first shows the tenacity of the fair-goers despite the rainy blustery weather on Sunday. 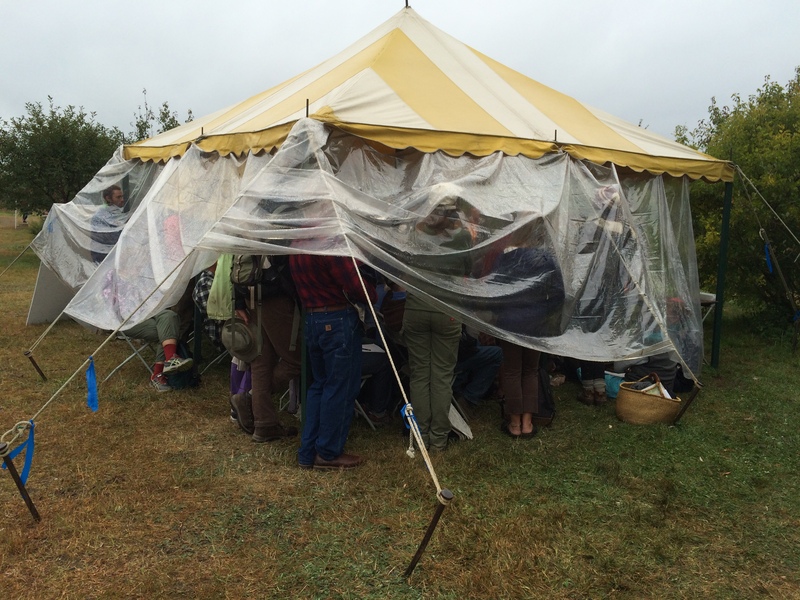 Crowded into a tent, with only their legs in view. Their heads were, I am certain, deeply engaged in the presentation. 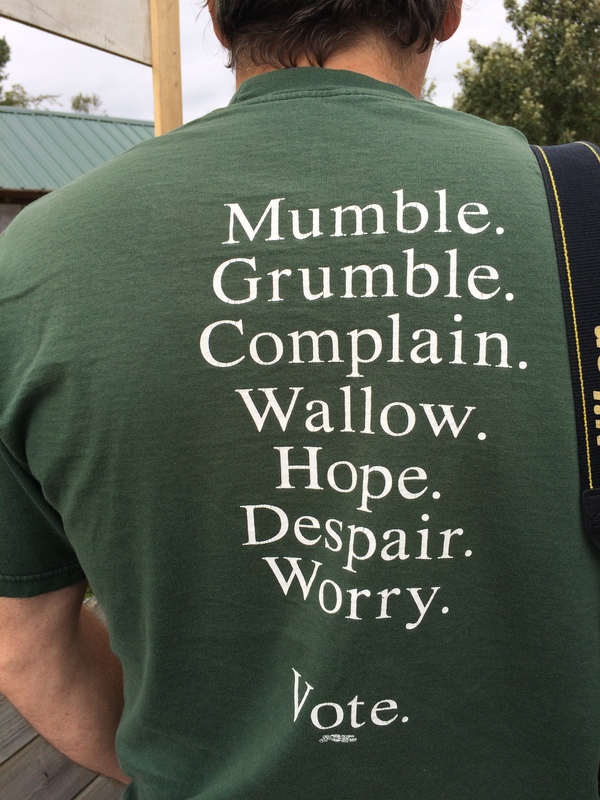 The front of his shirt said “Camp Wellstone”, as in the late Senator Paul Wellstone from Minnesota. 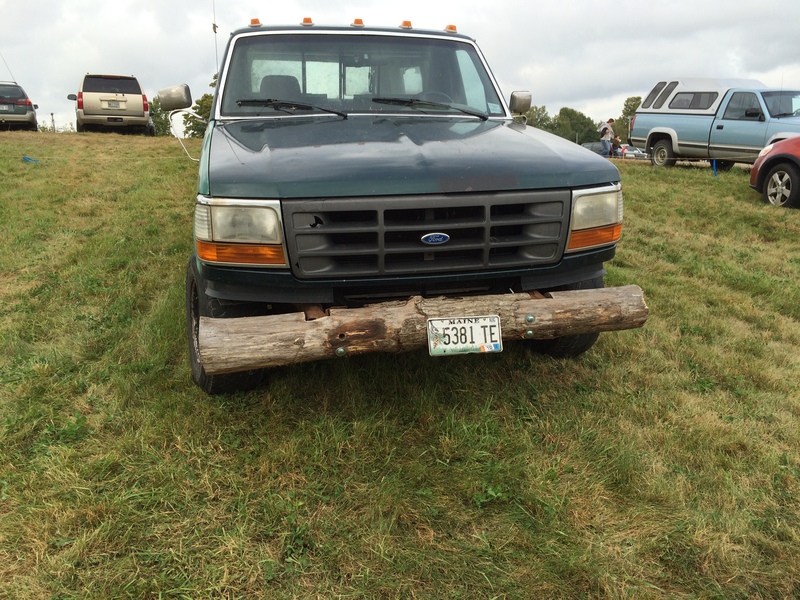 And finally, to end my day, this photo of what one fair-goer used as a bumper for his truck. 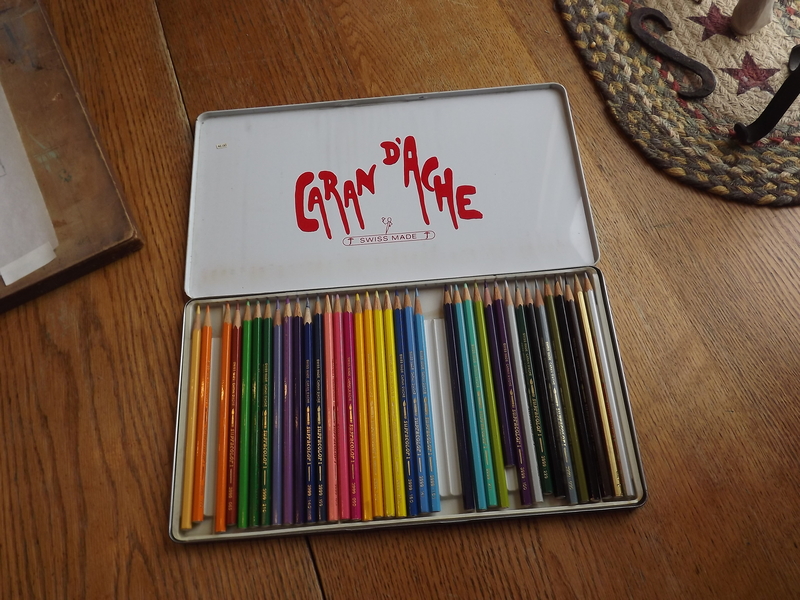 Because, after all, why not do for yourself, take care of yourself, and be creative – if you can? Only in Maine. 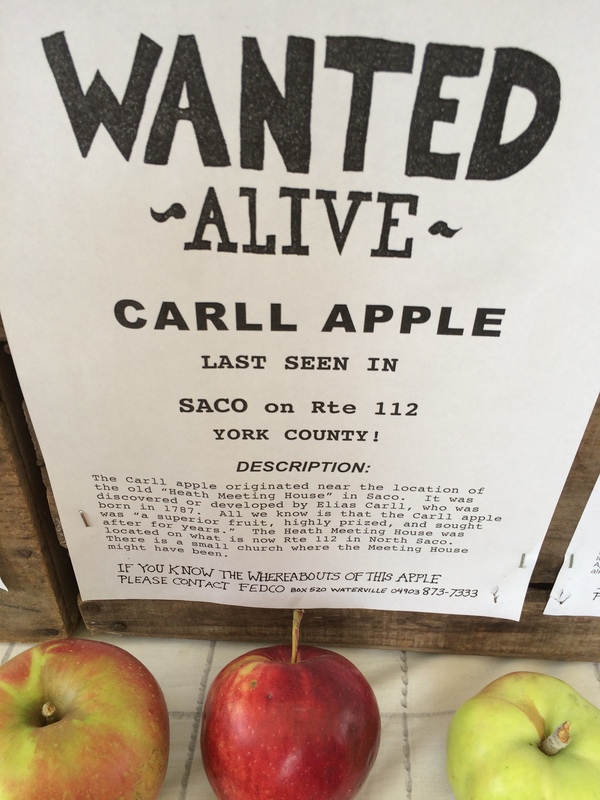 I came home with three scarlet runner bean seeds (Jack never had magic beans like these), my dowsing rods, tea, presents, heaps of business cards and brochures, and a desire to research the background of Switchel – an old-fashioned haying drink that was offered at one booth. 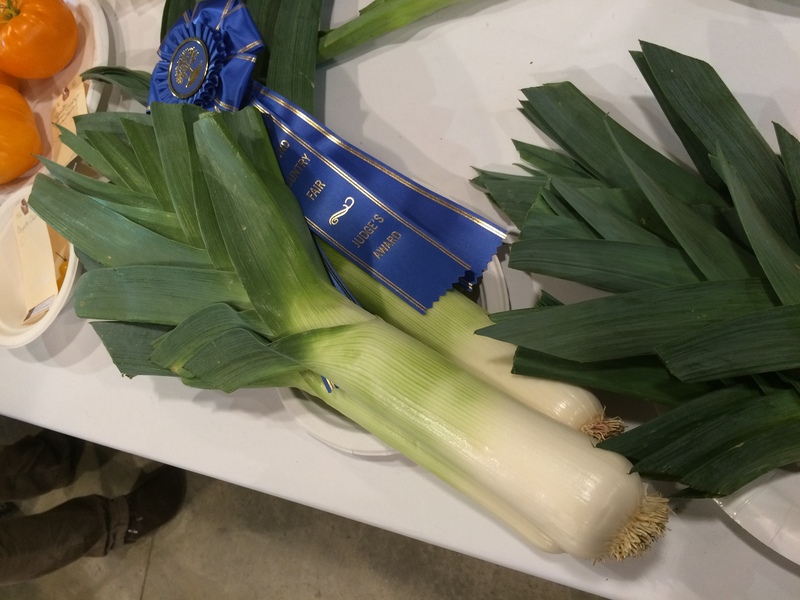 A concoction of water, vinegar, maple syrup, and ginger, it was as bright, delicious, and surprising as the fair itself. I’m going back. I just wish I didn’t have to wait a whole year. How did you spend YOUR Sunday afternoon? I spent mine in a room with about 30 “children” (ages 5-85), one instructor, and hundreds of worms. The worms (eisenia fetida, or “red wigglers” for the less lofty) have become my garden partners. I will feed them scraps from my kitchen, keep them warm and contained, and they will produce castings that will feed my plants. I think this is a very good deal. In addition to information about what they’re up to, the site includes recipes and an interesting blog. 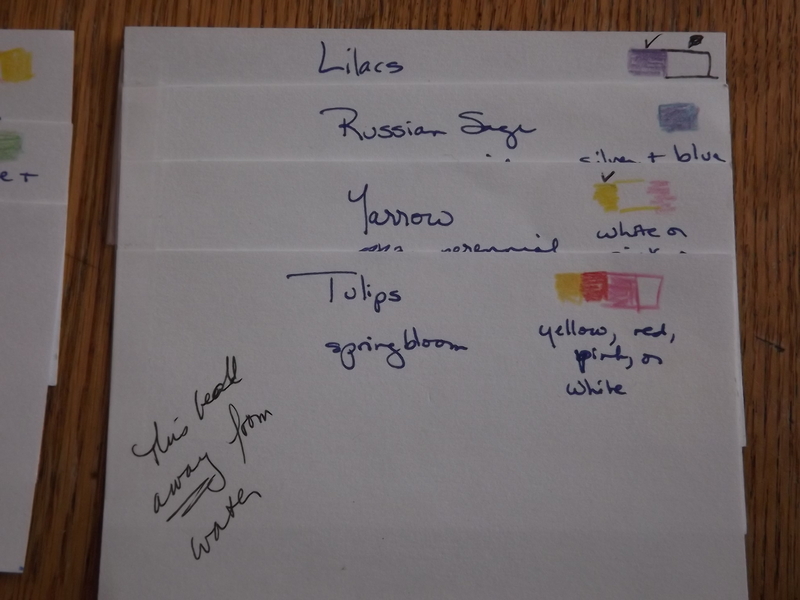 This class is useful at any time of the year, but is particularly poignant when offered to Mainers at the end of a very long winter, when spring is still many weeks away. (Mainers know that the calendar is a cruel mistress. What she says is virtually never what you get. So, March 20th is labeled the first day of spring? It is to laugh.) 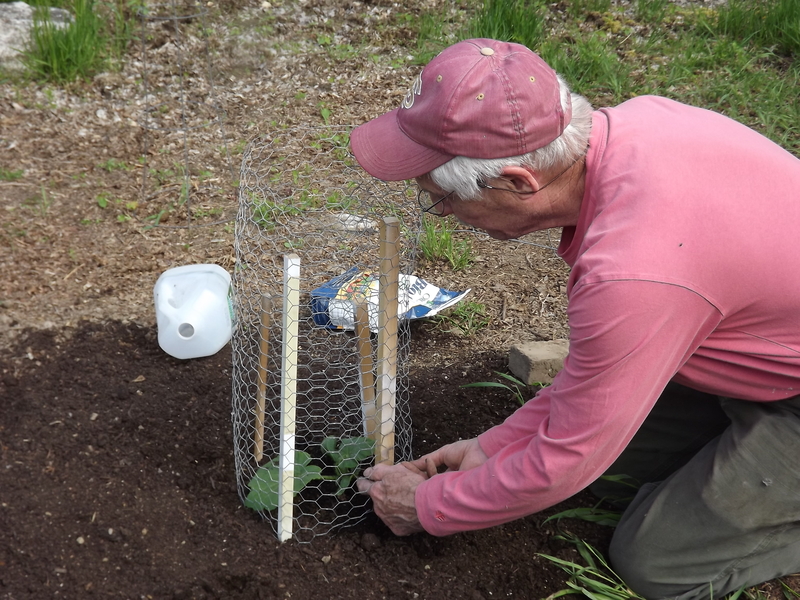 But thanks to my worm wrangling class, I can actually start on my garden, even when I shouldn’t start my seedlings until mid-April and I shouldn’t set my seedlings out until Memorial Day. No matter. The worms and I have plans. Here are a few photos from my happy Sunday. 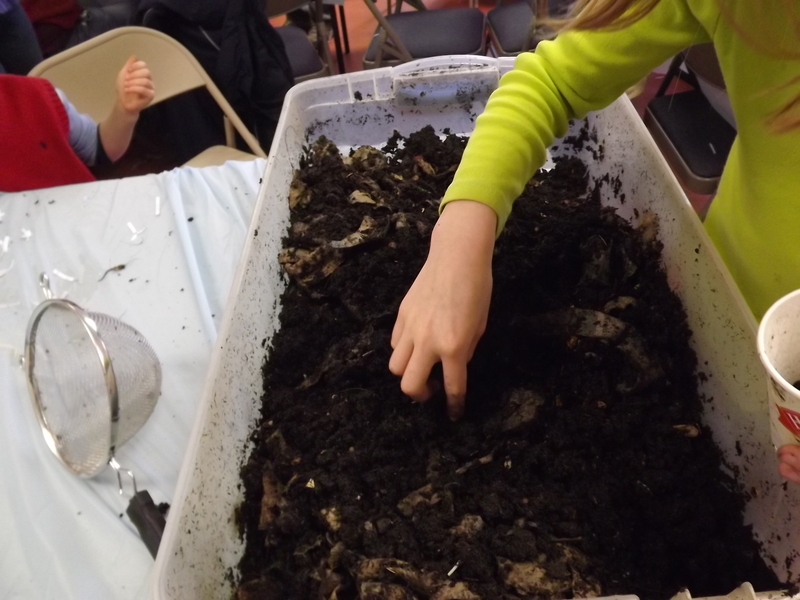 I’ve known about vermicomposting (using worms to transform kitchen scraps into compost) for years, but this was my first hands-on experience. It was a lovely reason to get my hands dirty. 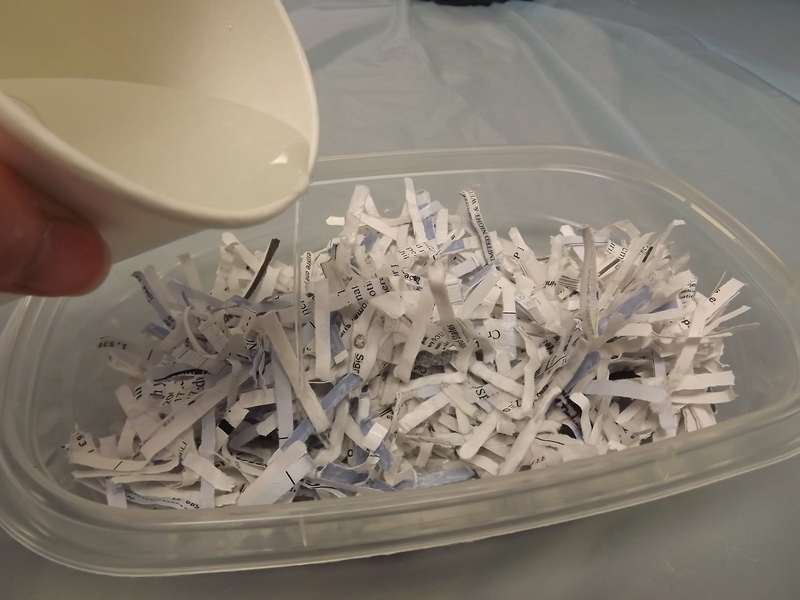 Next step: enough water to make the paper spongy but not wet. This was a delicate operation, and I confess I needed a rag to clean up the water that leaked out of the bottom of my bin. Yet another example of “More Enthusiasm Than Skill” (the name I’ve chosen for my autobiography, if I ever get around to writing it). Worms need grit to help them grind up their food. We were offered cups of garden limestone to sprinkle over the bedding. 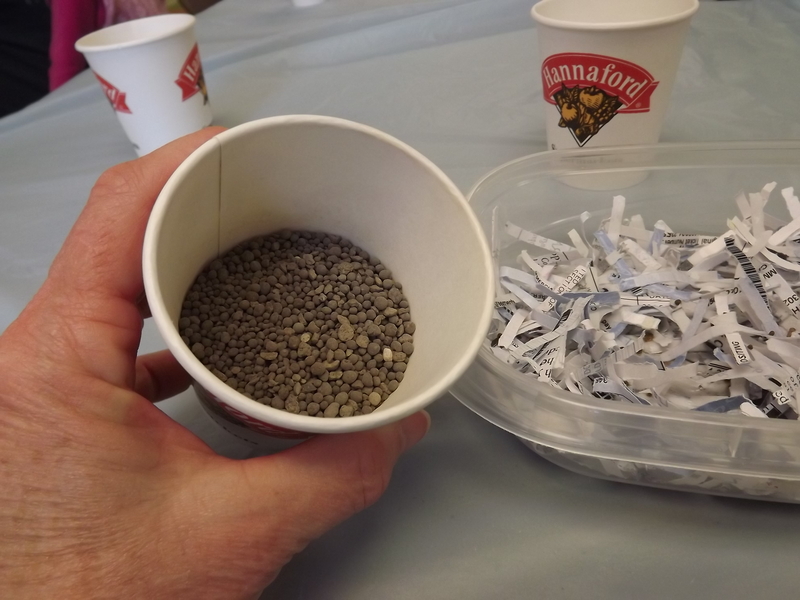 The instructor had brought in a large bin filled with worm castings and worms. We were given sieves to tap the castings into round balls that were then easily scooped into Baggies to save for our gardens. 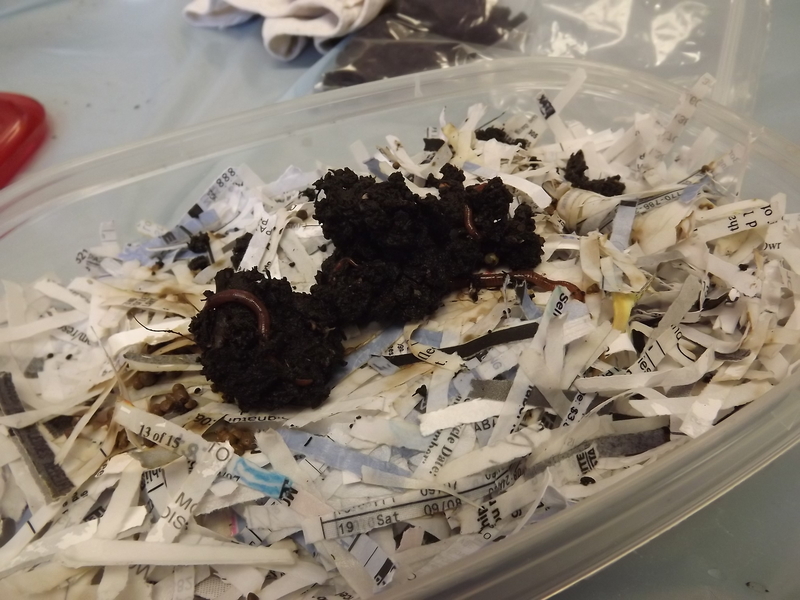 The worms were left exposed and were easily picked up and dropped into our bins. 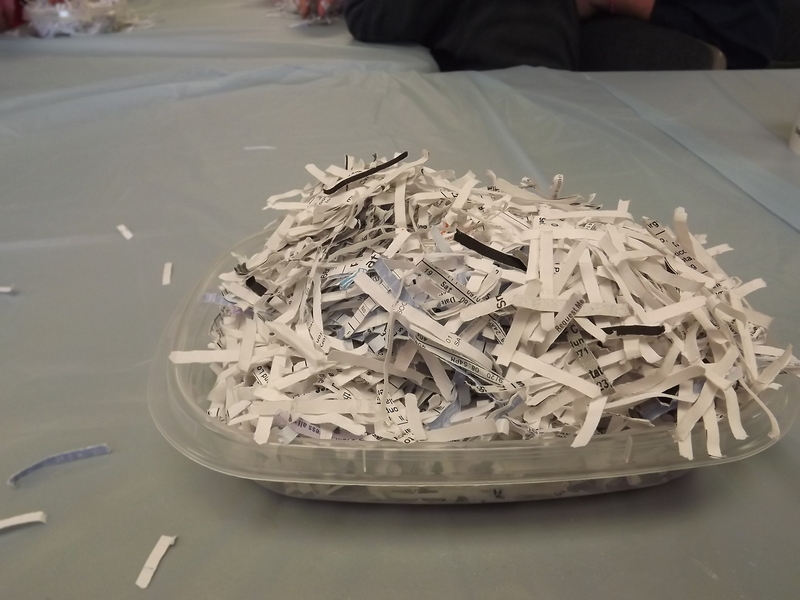 The instructor’s large bin was also available to the class for additional wrangling. One young girl was so thrilled at being allowed to collect worms that she offered to get mine for me. Of course I said yes! My big compost bin is not yet set up in my garden, because I’m not sure where the beds will be laid out. And every time I’ve tossed coffee grounds and eggshells into the trash, I’ve cringed at the waste and lost potential. But now, thanks to my red wiggler pals, my kitchen scraps have a new home and a new purpose in life. I think I’m gonna need a bigger bin. We have moved and things are different. Our mortgage is gone. Our taxes are halved. And my garden has doubled. 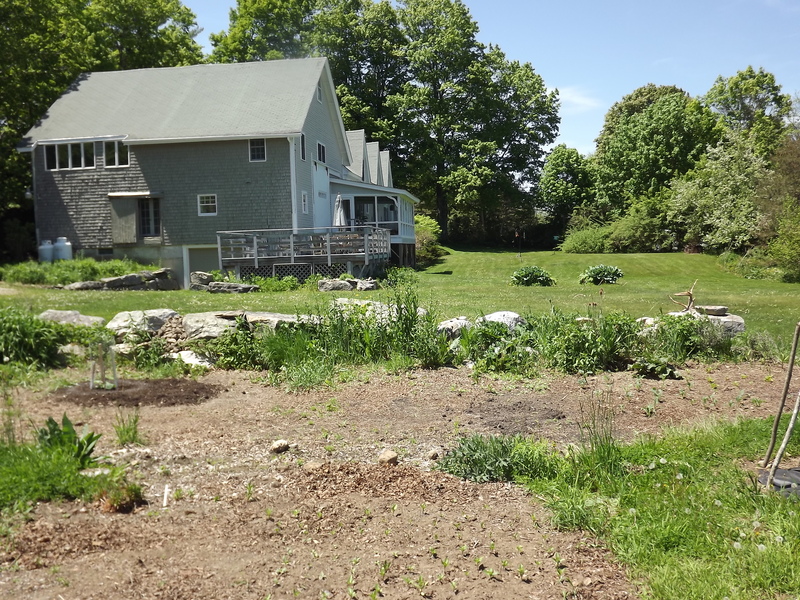 I left behind a 40’ x 50’ garden in New York, and now I have a 100’ x 180’ garden in Maine. I had better plan this carefully. Here is a photo of the sketch Husband did of the area I will be working on this year. The scale: 1” = 10’. The rectangular shapes are stone walls, and the poofy swirls are trees. From left to right, starting in the back: that smaller rectangular area has woods to the back and our neighbor’s field to the left (northeast). My plan is for this smaller area to have sunflowers, herbs, a seat for quiet contemplation, lots of fragrance, and lots of butterflies. 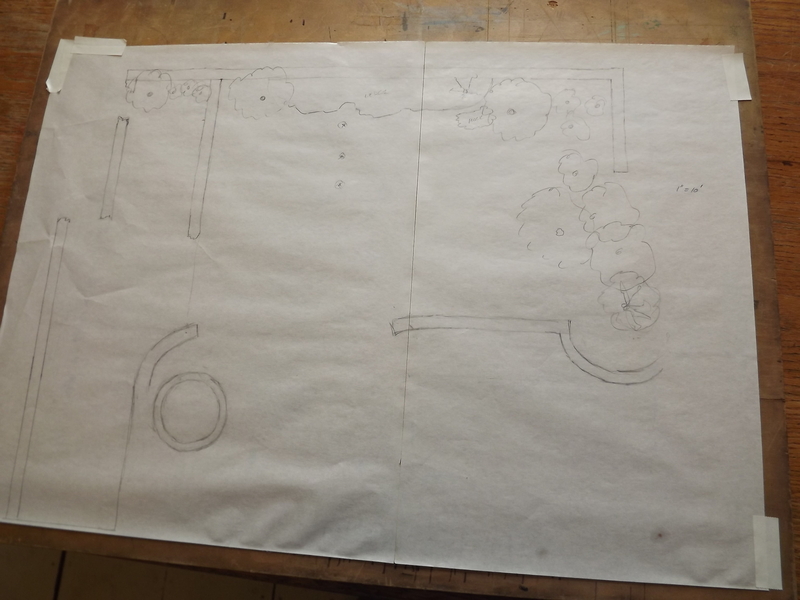 The larger area to the right will be the flower garden, with the wooded area at the far-right becoming the shade garden. The area in the left foreground will have the orchard (we have apple, peach, and pear trees coming on April 30th! ), and that circular area is the base of a silo. I’m thinking of a rose-covered arbor across the back half of that curve. Step 1. Don’t plan to do too much this first year. 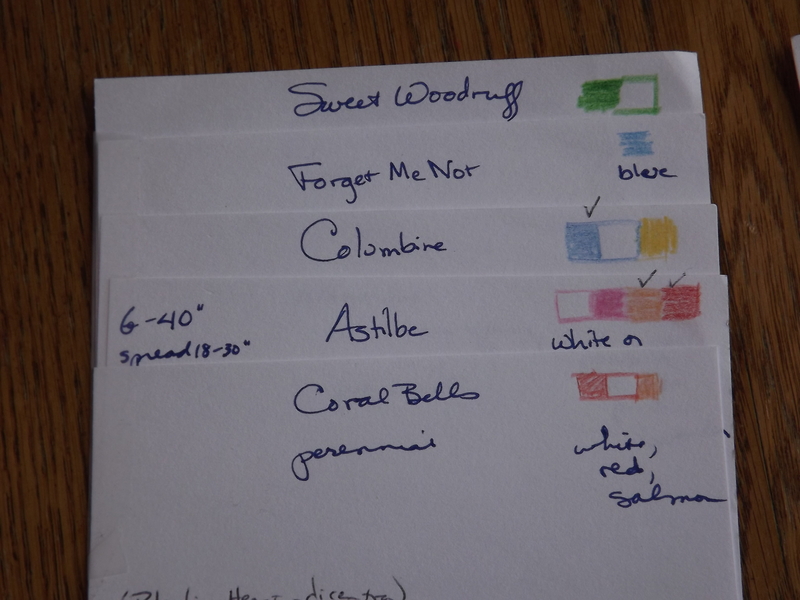 Because we are starting two new businesses, which includes Husband’s art gallery and studio, and a rental apartment above the studio, and because we are having the outside of the house painted in the spring, I cannot plant everything I would like this first year. I will not be planning or planting anything that is next to the house. I’m going to let the painters come and go as they will, trample anything they want, and I will not be biting my fist in an attempt to stop screaming. I will let this area go entirely. I have planned 11 flowerbeds out in the back field, and I will be happy if I get 4 of those beds up and running this year. Step 2: Know the enemy — earth. What is under that lovely dark, formerly-a-horse-farm soil that I have out back? Is it rich dark loam, enriched over the years by those long-gone horses? Or is it one or two inches of dirt sitting on top of rock ledge? We have lots of granite rearing up that we can see, and that I’m already planning to use as flooring or backdrop for seating in the garden. 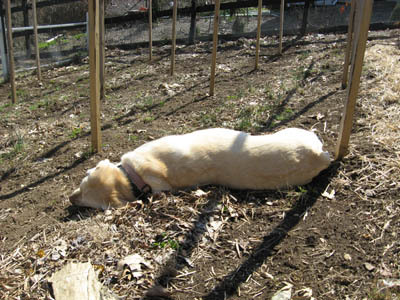 But the rest of that vast expanse….will I be able to dig beds there, or will I be begging Husband to supervise the construction of 11 raised beds? 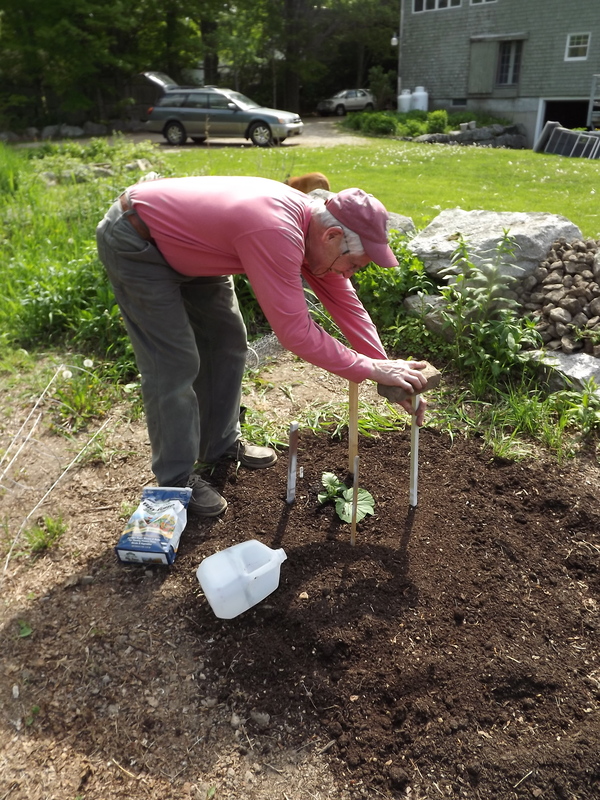 Husband prefers I dig into the ground rather than go to the expense of building raised beds. So as soon as the ground thaws (April?) we will be out there with a metal spike and a mallet, and will tap our way across the field, trying to determine how deep the soil is. We will be graphing the underground lay of the land. Step 3: Put my thoughts on paper. Step 4: Shuffle the cards, and stack the “beds”. I mixed and shuffled and reshuffled these cards for days and days. I wanted the tallest of the plants at the top of the stack, with the spring-bulbs at the bottom. 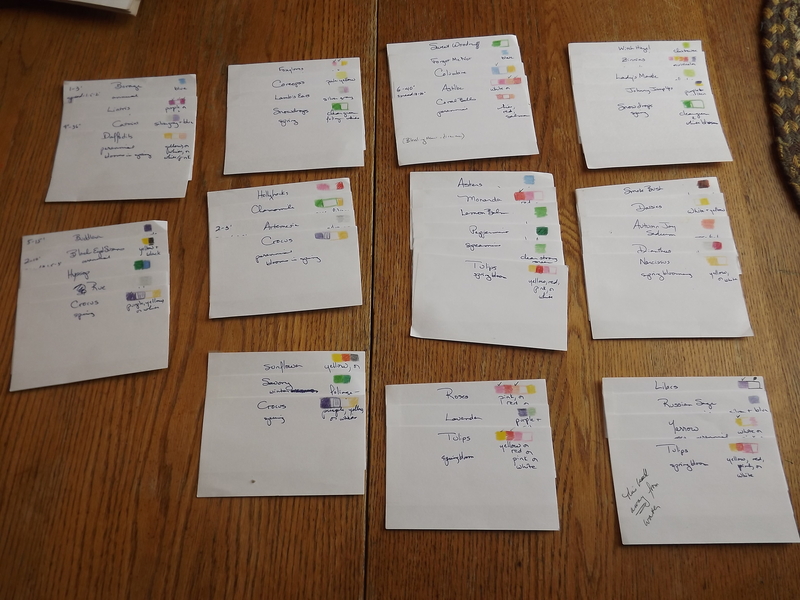 Once I was happy with the 11 stacks of cards, I taped them together so that I could then move the “beds” around and arrange them. I want a bed of mints, which means I need to plan ahead to thwart the invasive roots of these plants. I figured I would gang them up in one area, and install some kind of gulag around them. I’m planning to have monarda didyma to welcome the hummingbirds, bees, and butterflies, and flank it with lemon balm, and mint. While I wanted peppermint and spearmint specifically, I now know that mint plants do not produce true from seed, and so my seed packet is labeled, humbly, “Common Mint.” If I want specific mints, I will have to buy plants. I may do that. 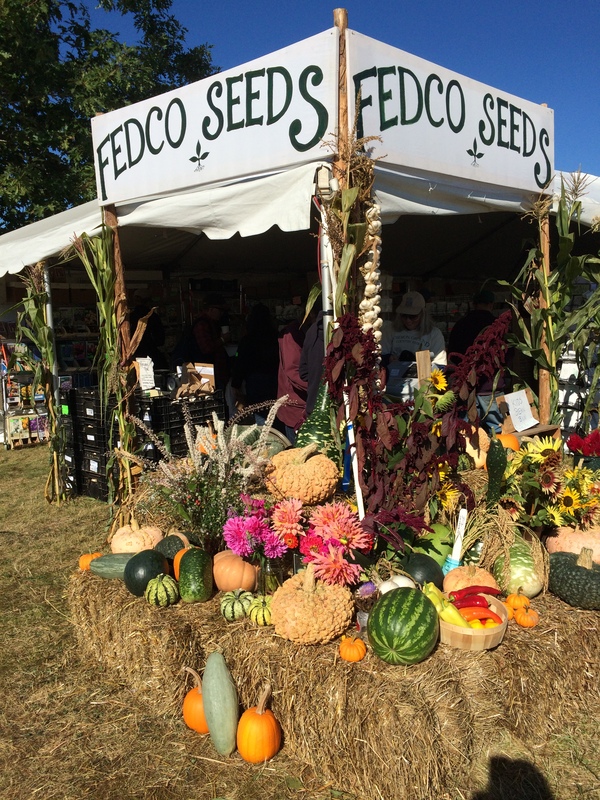 I ordered some shrubs, trees, and plants from FedCo, a cooperative seed and garden supply company in Waterville, Maine. My neighbors rave about them. 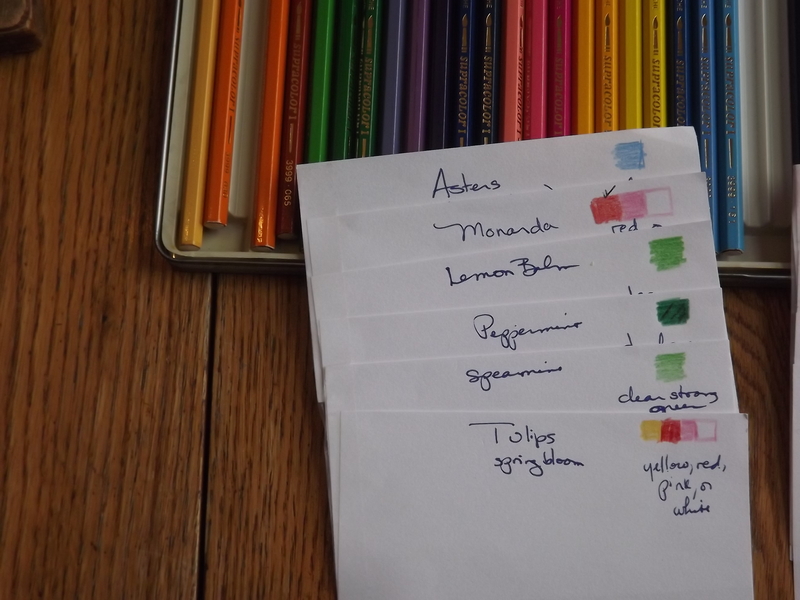 My garden heroes (Barbara Damrosch, for one) recommend them. 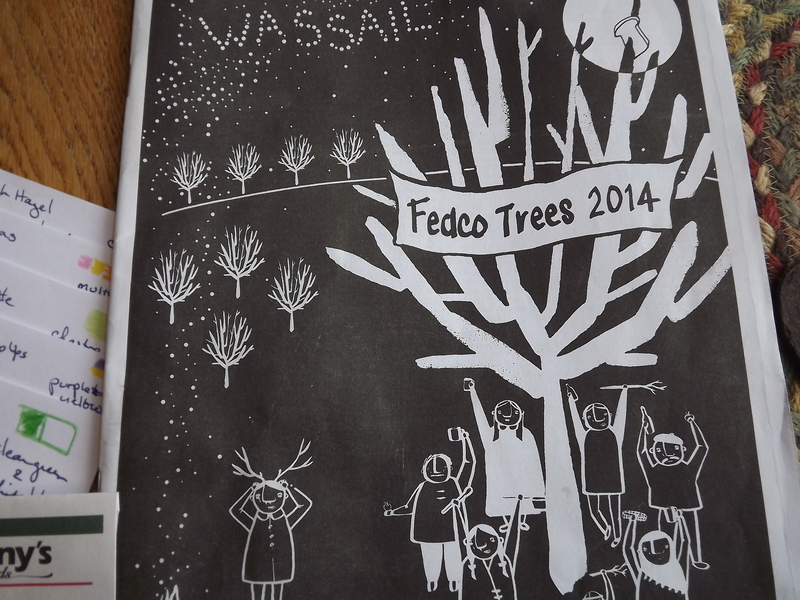 FedCo offers the plants and shrubs and trees that I want, and their catalog is jammed with wonderful advice. And their prices are astounding. I had to exercise enormous restraint when filling out my order form. I got all of my taller plants from them. Step 7: Know the enemy – Odocoileus virginianus and Meteagris gallopava silvestris. These super villains have secret identities: white-tailed deer and Eastern wild turkeys. They have free run of the place when my dogs are inside. I need to keep the deer out of my garden at night, and the turkeys out of the garden during the day. I have considered and rejected installing an electric fence. I am concerned, of course, with the safety of our garden’s guests, but truthfully, the most likely casualty of an electric fence ZAP would be me. 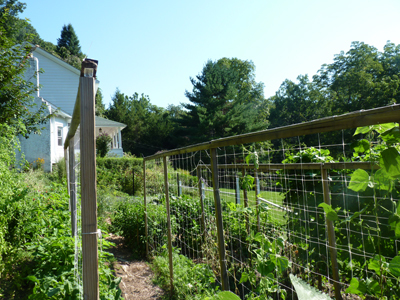 I tend to look down when I am in the garden, and I’m certain I would walk directly into that fence daily. 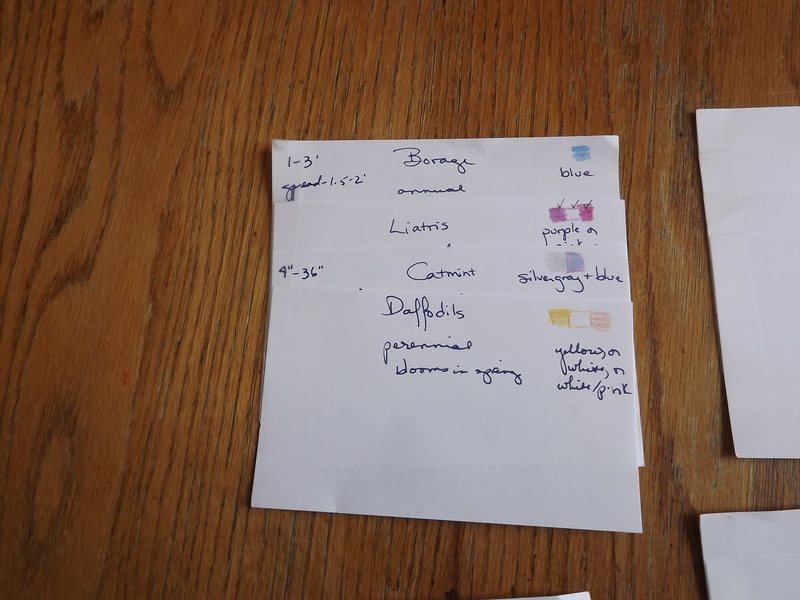 The plan, for now, is to buy yards and yards and yards of deer netting, and fasten it to the trees on 3 sides of the garden. 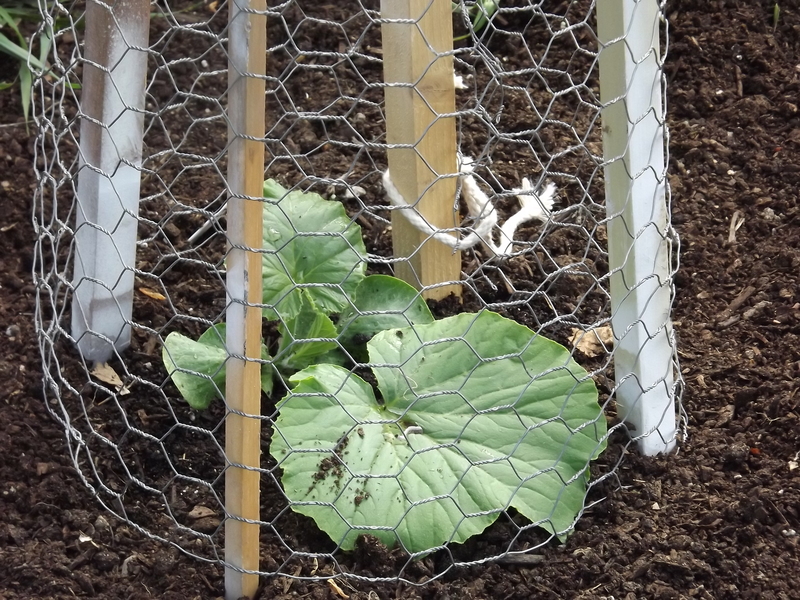 If that isn’t effective, I will add a 4th stretch of netting across the house-side of the garden, and will add another chore to the daily list: walking the “4th wall” across the garden and fastening it at the end of each day. I will be, I guess, tucking my garden in for the night. And so there you have it, my Plan to-date. What’s next? My favorite task of the year: Making soil cubes and planting seeds. That will happen in mid-March, and I am counting the days. My plan is to thwart cruel April by tending my seedlings inside. When May comes, I will have my memories of gardens past, and my desire answered by the seedlings. I will be ready. Today was a long day, and I am tired. I walked the dogs along the Damariscotta River, which I have done before, but today we ventured further than we’ve ever been. The newness proved exhausting. The woods were too close, dark, and cold for that early in the morning, and the river-dampened dogs were as unhappy as I was in my light sweatshirt. Later, I worked at my desk. I unpacked 2 boxes of books and emptied 4 plastic bins of my son’s clothing and desk accessories. And I marinated chicken for tonight’s dinner. But the most tiring event was gently cleaning beloved decorative plates that we found yesterday by surprise. 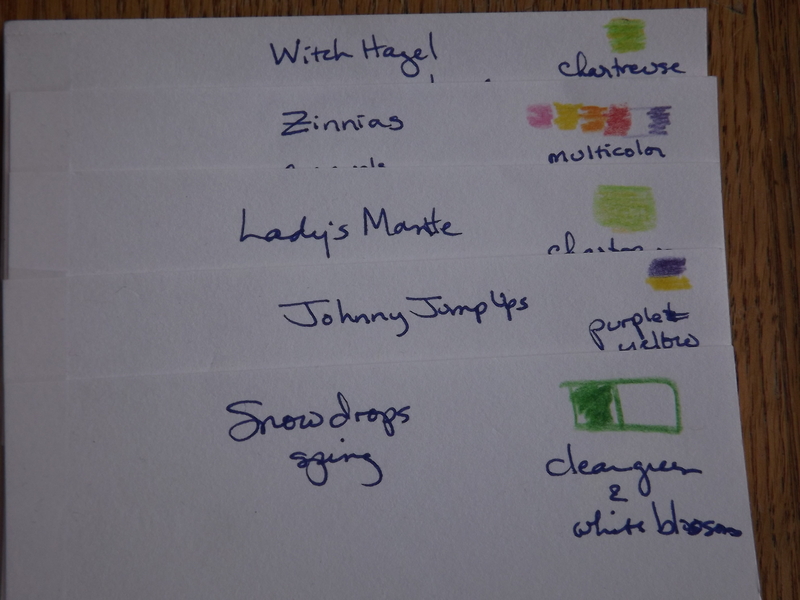 The box was badly labeled, and I find these incessant surprises more wearing than exciting. (Perhaps if I could find the juicer for the kitchen, and my warm sweaters for my closet, I would not be as petulant.) The plates were from my mother’s household. I was happy to wash them in preparation for putting them out on display. What made me tired was the emotion these dishes brought to the surface – memories of my gentle mother and how she loved these things, of the house in which I grew up, the scent of the lemon furniture polish she used, the untimeliness of her death. All from rinsing a few plates. I went to the kitchen window, not to look out, but to think about what I should do next. It didn’t seem right to start the evening with my husband in this tired, unsettled state. But of course, I did look out. On the lawn, in the fading light of this cool autumn day, were 8 robins. Robins! The birds I associate with spring and new beginnings. And while I am the very definition of New Beginning in this house, and had spent a good part of the day unpacking items to roll into my New Life here in Maine, it is autumn after all, and the world outside my window is winding down for the year. Seeing birds of spring was surprising. And yet, those robins were there, quietly dipping their heads into the deep grass, in short determined motions. I’m certain they’re feeding and hoping to pack on a little weight to hold them during their long trip south. A lot of Mainer’s are doing that now: getting ready to go south. Our new next-door neighbors will be leaving shortly. I’m sure the lines at the grocery store will reflect this new state of affairs soon. My life will be empty of close neighbors and robins. The birds are preparing for a new beginning in the sunny south. My new beginning will be my first autumn in Maine. I am looking forward to leaves that turn earlier, and a longer season of cinnamon donuts and pie. 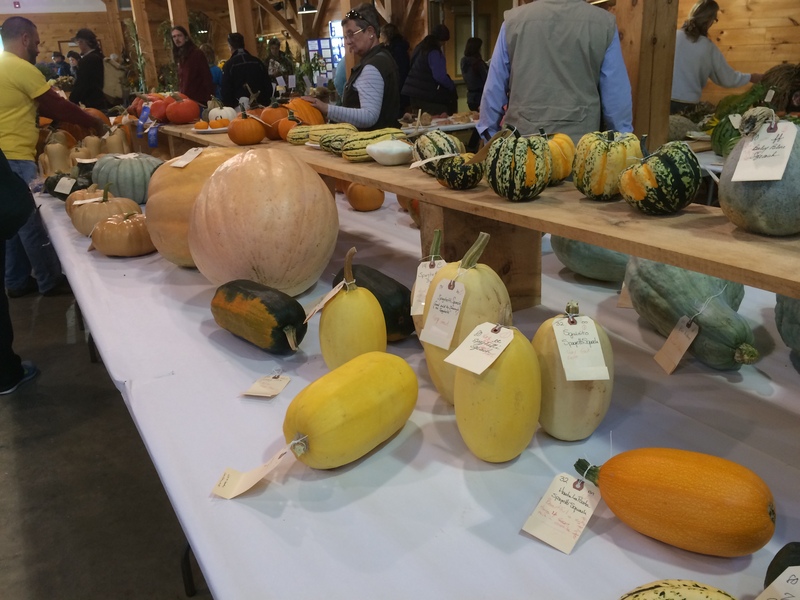 I am eager for this longer season of cold, when much of the warmth comes from the brighter color of the food – squashes, pumpkins, turnips, beets. How lovely that this season of rest and quiet healing will be new to me. I plan to sleep well tonight so that I am fully ready for tomorrow’s surprise outside my window. I will take my place in this new family of things. I am starting to say good-bye. My garden is part of my very essence. We came to this home five years ago: a lovely house, and an untended yard. Husband built me a 50 X 40′ garden on a south-facing slope. It was perfectly positioned, with rich, black soil. 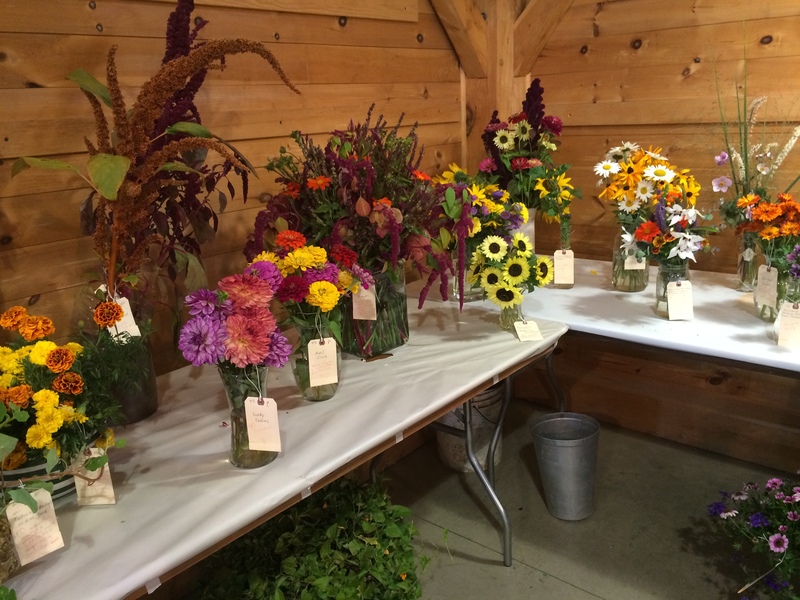 We planted, tended, harvested, and breathed. 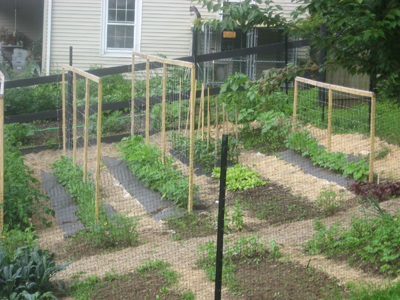 Here is how this garden fed me, body and soul for the last 5 years. 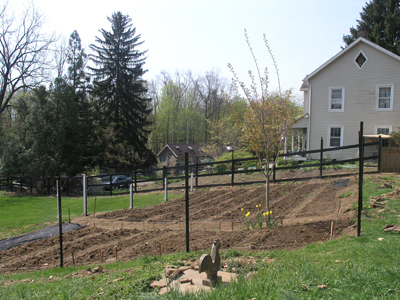 2009: The grass is removed, the borders are defined, and the deer fencing is up. 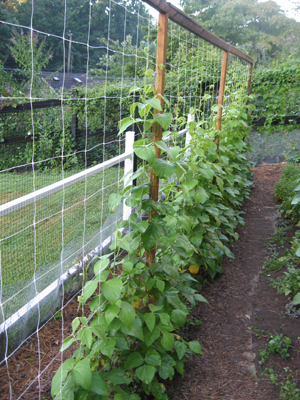 The trellises are in place, the paths are lined with newspaper to suppress weeds and covered in straw to please the eye. After one year, I’d settled in, and 2010 was the most spectacular year in the garden. I had enough time on the weekends and during the week to tend to the garden. 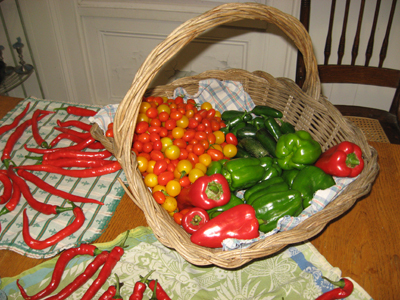 I planted, experimented, harvested, stored, shared, and reveled. 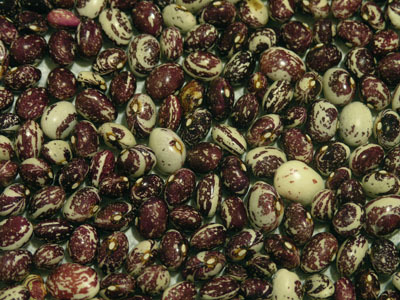 Good Mother Stallard beans are an heirloom variety of a dry shelling bean. 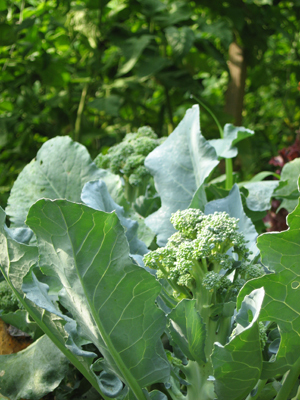 I love working in the hot summer garden to have something delicious to eat in the frozen winter. Good Mother Stallard beans, shelled. A feast for the eyes, too! 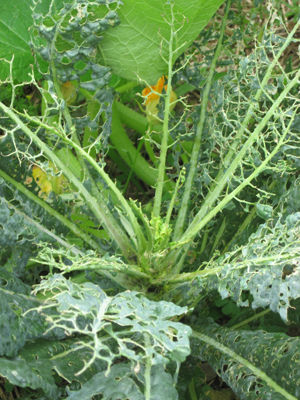 Broccoli, the Italian variety. 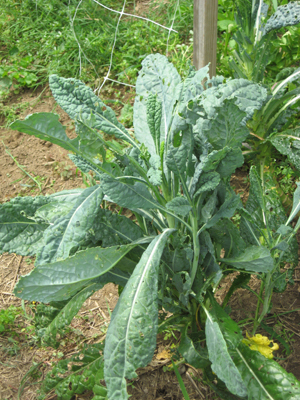 I preferred this variety and the Lacinato variety of kale, as both were sweeter and lighter in presentation than their American counterparts. 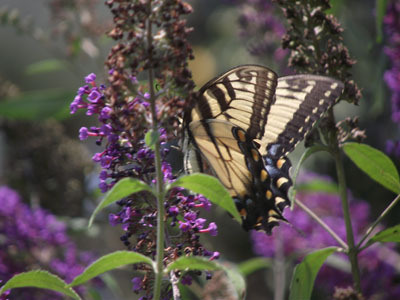 The buddelia bushes attract everything with wings. It is living art. 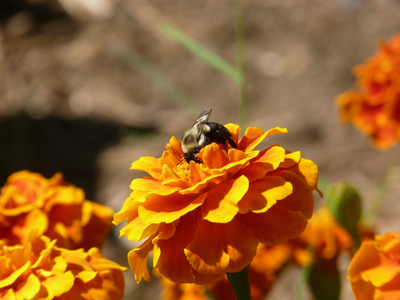 Bumblebee on Marigold. I’m also happy to report that in the last 5 years, I’ve seen the population of honeybees increase significantly. I experimented with different techniques in planting, staking, and harvesting. 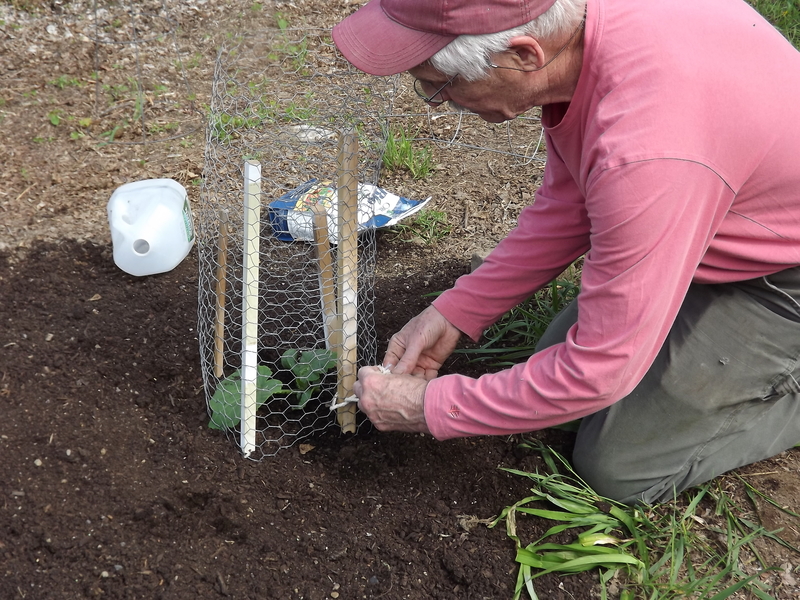 My favorite exploration was with the Florida Weave: a method of staking tomato plants that supports their branches at regular intervals by weaving string between posts. The first row of string supports the new plant. AFTER: The recovery was dramatic. I did epic battle with chipmunks. 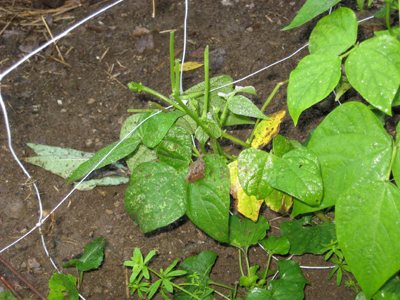 The little varmints discovered my delicious, young bean plants one year, and completely wiped me out. The growing vines were cleanly nipped, and the plants never recovered that year. NO GREEN BEANS. Disaster. 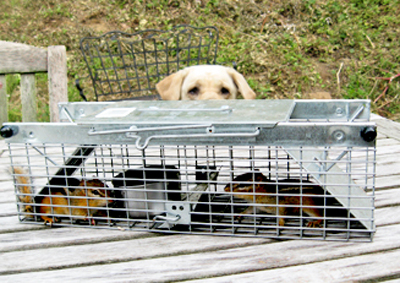 I spent the summer trapping and releasing (miles away) 37 chipmunks. MacKenzie was interested in this process. 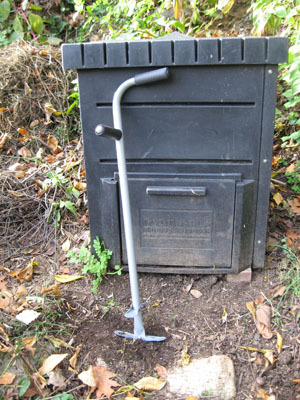 Compost Turner: Insert deeply into compost, turn, and lift. The compost is fluffed and aerated. I admit, only a Garden Geek would find this thrilling. The broadfork. 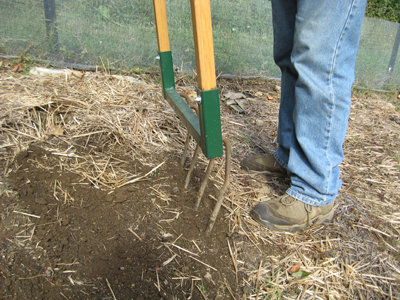 It aerates the soil without disturbing the tilth. Place, step down, rock back, remove. Again, thrilling! 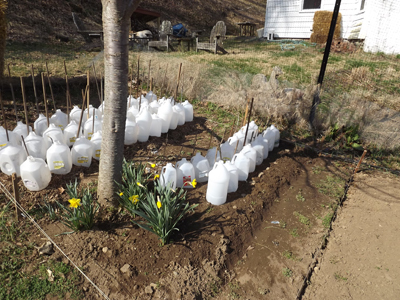 Pea plants are sprouting under those jugs. 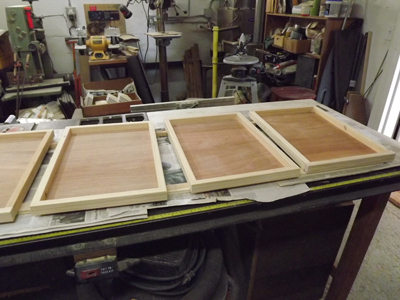 3 out of 8 trays: Pre-polyurethane. 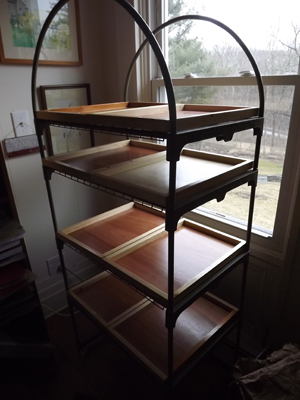 The trays in place, by my office window. Another fabulous tool is the soil-block press. This particular one makes four 2″ square cubes at a time. 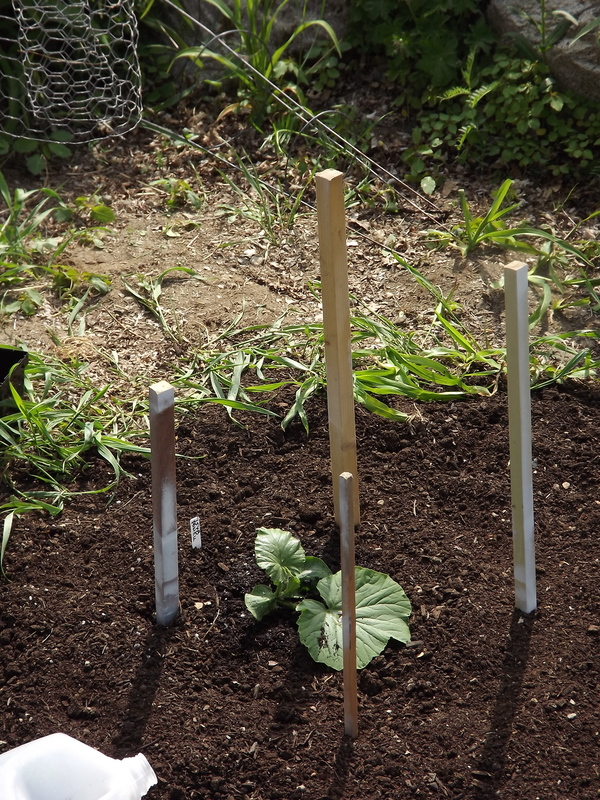 These cubes allow the seedlings to grow without becoming root bound. 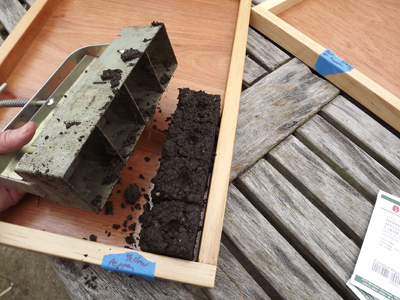 The first soil cubes go into the tray. Ready for planting! 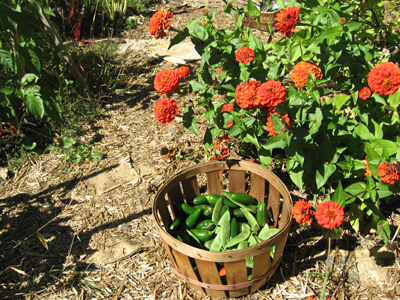 A basket of beans next to a heavily laden zinnia. 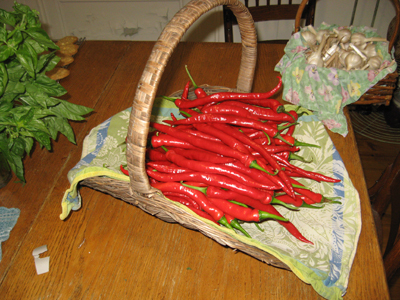 Harvested green, because frost threatened that night. 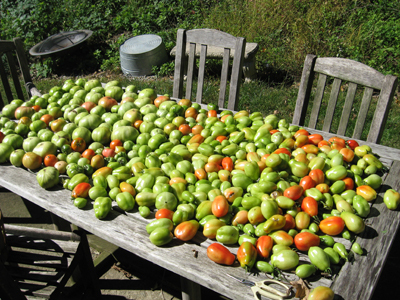 These were wrapped in newspaper to ripen, and made into sauce. 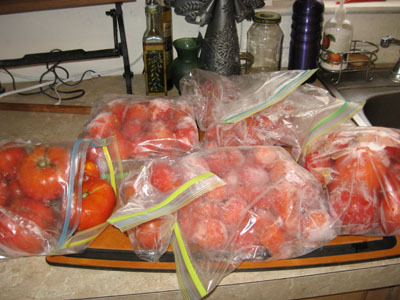 Too many tomatoes to can immediately? I froze them, and canned at my leisure. 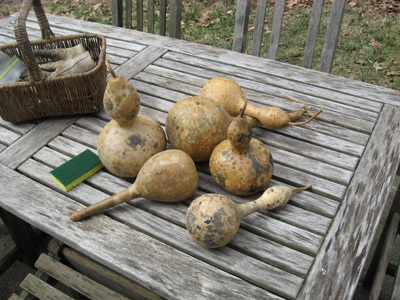 They resembled bags filled with croquet balls! 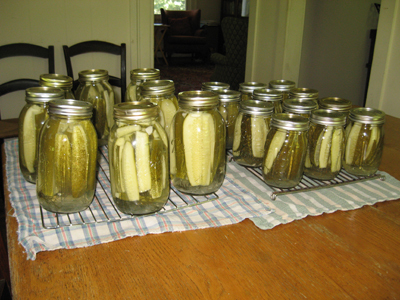 Jar after jar of pickles. Dill and sweet! 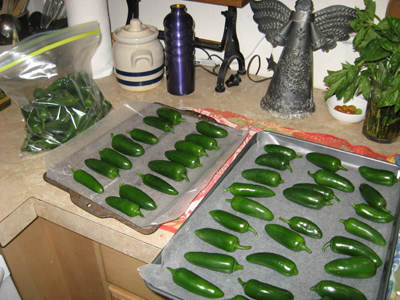 Jalapeno peppers, the Dulce (sweet/mild) variety. I froze many and canned even more. This was in 2010, so to my 2012-13 office-mates, please forgive! 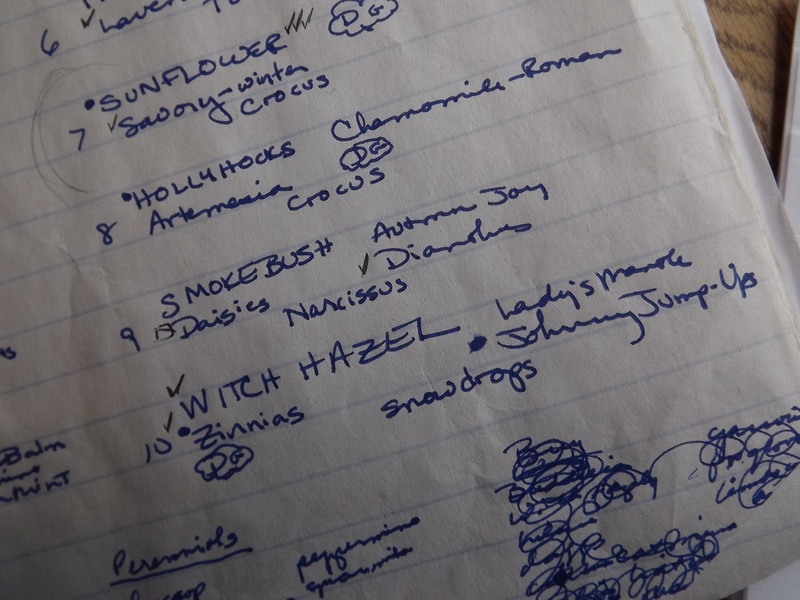 I was growing flowers almost exclusively during my time with you. …a curtain of sorts. 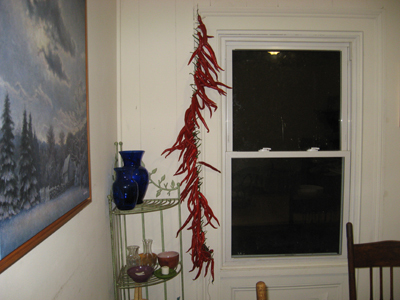 I harvested enough to make curtains for both windows. They dried, and were a cheery decoration that looked especially nice during the holidays! I dried them until you could hear the seeds rattling inside. 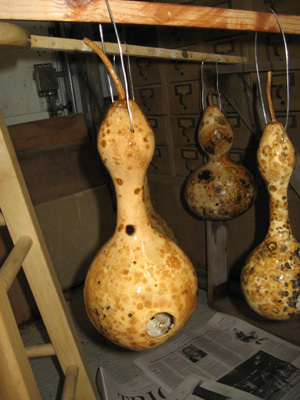 I used a dremel to grind a hole, tapped out the innards, brushed them with polyurethane and hung them to dry. And yes, we had birds move in! I had the Summer of the Snakes. 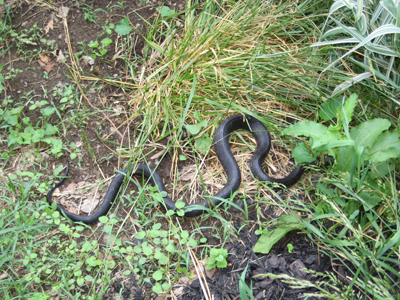 2011 was the year when Black Rat snakes made frequent appearances, getting tangled in deer netting, and tangling our heart strings. Husband and I rescued 4 and had to bury two. It was emotional, more than a little unnerving, and ultimately gratifying to see the survivors slide away. 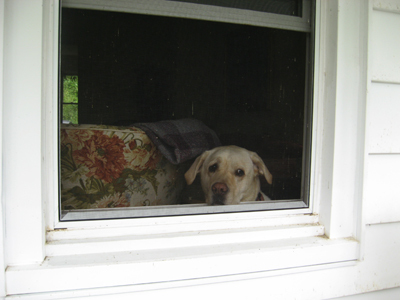 MacKenzie was a little too interested in these events, and was banished inside the house. Going back to where he belongs. Banished MacKenzie, broken-hearted at being removed from all the fun. On the wrong side of the fence. And sweet MacKenzie just wanted to be near me. As long as a bed wasn’t planted, I had no objection to her using it as, well, a bed. 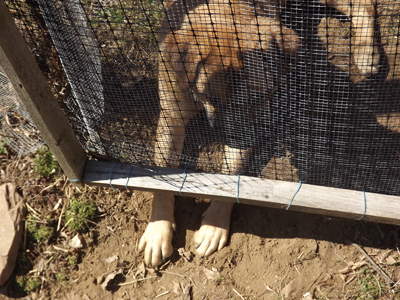 MacKenzie warms the soil, prior to planting. All of these topics have been discussed in past posts. You can find more info and more photos by searching for key words/phrases. It is a place of beauty, food, scent, and solace. I hope to carry what I have learned and felt to my new garden, one gardening zone north, and a whole new Life away.